The previous articles in this series postulated the creation of a sustainable and world-class textile industry in sub-Saharan Africa. The authors’ case made provision for every step in the process, from growing the cotton plant to producing the dyed and finished fabric – on the African continent. All that is left is the garments themselves. In the final instalment, Andrew McLachlan and Brian Bakker consider the development of an African apparel industry. 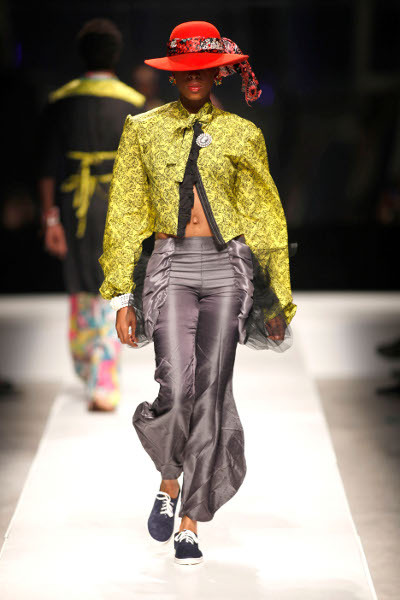 What of an African apparel industry? Unfortunately, the idea of developing an African apparel industry is nothing new. Africa has had a long and undistinguished history as far as the making of final garments is concerned, virtually all of them spectacularly unsuccessful. Certainly, there are isolated pockets of the apparel production industry that have survived and even thrived. However, there is nothing approaching the scale of what would be needed to produce enough garments for local markets – let alone produce enough quality apparel to satisfy the demand from international markets. Among those countries in which garment making has been tried, Lesotho and Swaziland illustrate how business success can be achieved at the expense of basic human labour rights. Both countries welcomed Taiwanese investors and made concessions such as long-term tax breaks in the pursuit of employment opportunities for the local communities. All to no avail: Promises were not kept and today the garment manufacturing industry in those countries is a shadow of what it could have been. There have also been disastrous foreign direct investments welcomed into several African countries in the textile industry, and more specifically the labour-intensive apparel industry. Examples include the Ramatex Textile and Garment fiasco in Namibia and the multi-million dollar promises elicited from the Ugandan government to establish a Tri-Star Apparel of Sri Lanka factory in Bugolobi, Uganda, in 2007. Neither of these ventures delivered revenue for the countries involved. In the latter case, Tri-Star was guaranteed a loan of US$5 million from the Ugandan Development Bank, given tax waivers on equipment imports and given free premises to undertake operations. The company was also subsidised to train local workers in garment-making. Tallying the cost after Tri-Star shut down operations when the African Growth and Opportunity Act (AGOA) Multi-Fibre Arrangement terminated in 2005, is revealing: Tri-Star did not use one kilogram of Ugandan cotton in its operations; it imported all materials used in the factory from south-east Asia and took full advantage of the AGOA agreement to maximise profitability. The net result for Uganda was that its exports to the United States of America for the year 2005 totalled merely US$4.5 million, while those of neighbouring Kenya amounted to a whopping US$278 million, according to an AGOA 2006 Assessment Report. Similarly, the Ramatex fiasco did not help to develop a sustainable garment-making industry in Namibia. However, it is worthwhile noting that the losers as a result of these deals were not the national governments; the thousands of local workers who were exploited and whose rights were abused by these companies are the ones who suffered the most. At this juncture it is worth noting that Africa has not been able to maximise the favourable export opportunities that were afforded by the terms of AGOA, or even the GATT (General Agreement on Tariffs and Trade) with the European Union. Instead, countries in Africa have relied on their status as developing economies to attract foreign investment – typically from unscrupulous multi-nationals – in an attempt to find quick fixes for our ailing economies. That this strategy has not worked for the average African worker is now abundantly clear and it is time that we Africans found another way to make an impact on the global market for apparel. 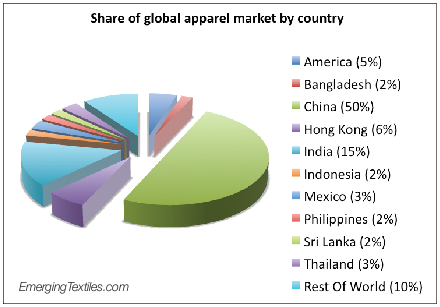 It is notable that in the chart, depicting share of the global apparel market by country, Africa is not mentioned at all. That’s because the continent is lumped in the “rest of the world” figure. In actual fact, the picture is even bleaker than that: The size of the global apparel market in 2010 was estimated to reach US$1 782 billion; Africa’s share of that was less than 1%. The bottom line is that Africa is seen as an insignificant player in the global apparel market and the outlook suggests that this view is not likely to change any time soon unless we Africans do something to change the perception. There are a great many factors to be taken into account when considering an investment in the apparel industry. Among the key issues are: Labour productivity (usually very high in China); quality and cost of available textile materials; energy prices; lead times (to key markets); services offered to apparel importers or brands (by host countries), import tariff rates in Europe or the USA (from host countries) and cost of freight. On the plus side, Africa currently enjoys favourable import tariff rates to both Europe and the USA. And as illustrated in previous articles in this series, spinning, knitting, dyeing and finishing facilities could be established with relative ease. One area in which Africa has challenges, however, is the cost of labour. 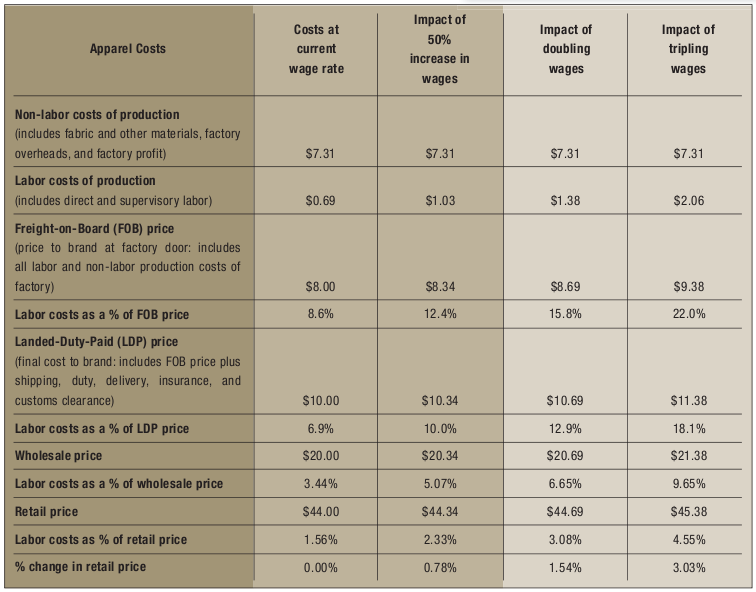 What is notable is that in the table provided on Apparel Manufacturing Labor Costs in 2008, sub-Saharan African countries, with the exception of South Africa, do not feature on the list. The simple reason is that, in global terms, there is no garment industry to speak of in the region. In addition, none of the African countries that are listed can offer really competitive labour costs – competitive with the likes of Bangladesh, India and Vietnam, that is. And if we take South Africa as a lesson, the rest of the continent should be careful to avoid the quagmire that country got itself into; one that led to thousands of job losses over the last few years. The simple reality is that while the demands of the workforce are reasonable given the high cost of living in the country, those demands have led to the virtual decimation of the mass-market apparel industry in South Africa. However, as will be shown, that was only partially as a result of increasing labour costs and mostly due to other factors. Unlike spinning, knitting, dyeing or finishing, the garment assembly portion of the industry is highly labour intensive: To establish a working garment facility, the capital outlay required of an operation involving 1 000 employees would be in the region of US$7 million (this estimate is achieved by adjusting Tri- Star’s 2007 investment in Uganda for inflation). However, if the consequences of wage increases on production costs in the apparel market are analysed, one finds that labour, as a percentage of the final garment cost, is not very significant when other factors are concerned – which is not to say, however, that it is not a factor when choosing the location for an apparel factory. Far from it. Investors in the apparel industry are constantly looking for opportunities where labour costs are very low. And Africa can influence this model by opening up borders within the continent. If, for example, African countries were to join the common customs union of the Southern African Development Community (SADC), the Southern Africa Customs Union, and extend it over the entire continent, it would remove roughly 25% of the cost of moving a garment across a border. Another factor is so-called profiteering on the part of retailers: Over half the cost of a finished garment is taken by the retailer channel. It may be useful for African governments to offer the retail channel tax breaks based on the percentage that 100% African-made goods make up of their total sales, and by the same token, and given the comparatively short lead times that would be possible if garments were made in Africa, to encourage retailers to invest in growing an African apparel market. In order to establish a sustainable African apparel industry, however, the nature of the market has to be understood. As is indicated in the accompanying chart, 50% of all apparel is currently produced in China, and the figure is expected to grow to 70% going forward. This has profound implications for the jobs in other markets, particularly in Central and southern America, as well as the few jobs still left in Africa. Referring back to the table of labour costs, it is clear that in order to compete in the market, the rate of labour should not exceed US$1.08 per hour and the rate of productivity at the very least would have to be a match for the Chinese. However, some leeway may be found in the fact that Africa could have a lead-time advantage over China and other points east – certainly for its own markets and potentially for those in Europe as well. But again, customs duties and tariffs internal to the continent would have to be eliminated. Furthermore, instead of exporting all its ginned cotton to Asia for spinning and value-add, the spinning, dyeing and finishing could be undertaken in Africa, with garment-makers sited close to those plants. This could reduce lead-times from the current 180 days to 60 days or less. The saving in finance costs alone would be significant and would no doubt pique the interests of African apparel buyers. It should also be borne in mind that large African-based apparel retailers presently have little choice but to source the bulk of their overall offering from outside of Africa. South Africa’s Edgars Consolidated StoresLimited (Edcon) illustrates this continent-wide trend quite well: According to a case study on the apparel procurement site, Eqos, Edcon sources 40% of its goods internationally from 25 countries, shipping via 55 ports of lading. Unfortunately, many of the impediments to creating a viable textiles industry on the continent, as postulated in this and previous articles in the series, are internal barriers. Certainly, there are political considerations associated with removal of trade barriers between African neighbours but perhaps the African Union could use the facilitation of such negotiations as an opportunity to earn its keep, as a first step. Secondly, there is the issue of internal African infrastructure – or rather, the lack thereof. One thing is certain: for any such industry to be successful, governments will have to come to the party by helping to develop the necessary road and rail infrastructure between different elements of the industry – whether they are involved in the growing, spinning or knitting or cotton, the dyeing or finishing of fabric, or the assembly of garments. One of the challenges increasingly facing Africa is that of unemployment. As was seen, the most labour-intensive part of textiles production is the final assembly of the final articles, be they apparel, linen or towelling products. The skills to do these jobs should also be relatively easy to develop. All that would be required is a stable source of finished fabric, which would mean developing each element of the production chain to its fullest potential for the good of the continent rather than for individual countries. African countries must begin to work in concert and for the good of the continent first – and themselves second. In that way, we, as Africans, will be able to transform the current global perception of Africa.